Ready for the clone wars? On July 5th, 1996, Dolly the sheep was born. Dolly was the first mammal to be cloned from an adult somatic cell. Dolly lived her entire life at the Roslin Institute in Scotland. She had six lambs of her own, and lived to the age of six. 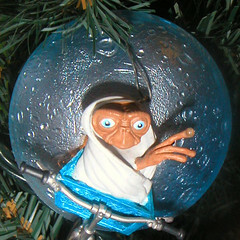 ET phone home… On July 6th, 2003, a message was sent out to five different stars. The message, Cosmic Call 2, was broadcasted from Eupatoria, a 70-meter radar. The message was sent to the stars Hip 4872, HD 245409, 55 Cancri, HD 10307, and 47 Ursae Majoris. The message should reach its destination in 2036, 2040, 2044, 2044, and 2049 respectively. Talk about your long distance phone calls. Well I’ll be a monkey’s uncle. On July 10, 1925, in Dayton, Tennessee, the Scopes Trial began. John T. Scopes, a high school teacher, was accused of teaching evolution in the classroom in violation of Tennessee law. On July 10, 1997, London scientists report their DNA analysis of a Neandertal skeleton, nicknamed African Eve, found in modern day Ethiopia. The results place her life at roughly 140,000 years ago, which supports the Out of Africa Theory. This theory states that all our ancestors originally came from Africa. An alternative theory is the Multiregional Origin Theory, which states that our ancestors developed independantly in different regions of the world. Previous Post Big BEETLE Bonanza!